Stanford Advanced Materials (SAM) supplies high quality silver methanesulphonate with competitive price. 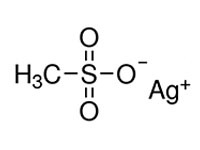 Silver Methanesulphonate (AgCH3SO3) is a catalysts used in many reactions. It is white to gray white crystalline powder and stable under normal temperatures and pressures. Storage condition: Store in a cool, dry place. Store in a tightly closed container. 1g, 5g, 50g, 100g, 500g, 1000g in glass bottle or customized.